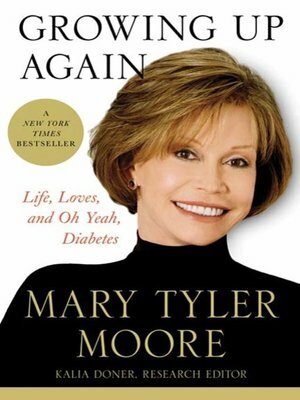 With generosity of spirit, ebullience, and sly humor, Mary Tyler Moore presents the intensely private, often funny, and sometimes startling story of her life with diabetes. Growing Up Again is a delightfully candid read for her legion of fans, the more than 20 million Americans with diabetes, and everyone struggling to cope with life's unexpected challenges. Mary Tyler Moore, actress and activist, relates the highs and lows of living with type 1 diabetes for the past forty years. With inspired, well-crafted prose, she drills down to the most heartfelt, yet universal truths about life—including the lives of those with diabetes. She unflinchingly chronicles her struggle with diabetes, as well as her successful rehabilitation from alcohol dependence, all while deriving gratification from her roles as an actress, mother, businesswoman, campaigner, and fund-raiser. Her revealing tales of both her successes and failures in coping with diabetes offer others with the disease guidance and inspiration through example. In the book, stories include her rebounding from a low-blood-sugar episode during a Mary Tyler Moore Show script reading after the director poured orange juice down her throat, to misadventures caused by diabetes-related vision impairment at a dimly lit party for John Travolta. She also taps into the vast diabetes research network to talk to diabetic children and adults and with leading experts who are discovering new ways to control diabetes and its complications, and pursuing new ways to cure this disease.